+234 803 850 0515 20 Ifateludo Street, Ifako-Gbagada, Lagos, Nigeria. - Every siege surrounding my marital destiny, DIE! - The ancestral spirit of my family line, attacking my marital breakthrough, enough is enough, DIE! - My foundation hear the Word of the Lord, cooperate with my marital destiny in the name of Jesus. 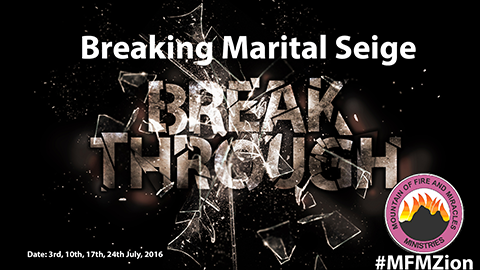 - The siege over your marriage scatter by fire, in the name of Jesus. So shall it be, in the name of Jesus. Mountain of Fire and Miracles Ministries, Zion: Place of Covenant Assembly is place for a mountain top living and life fulfilling. MFM Zion ICT. Powered by Blogger.